An interesting mix! This cellar door is on the main street of Willunga, in what was previously an antique furniture shop. The wines are made from estate grown grapes in the Adelaide Hills GI next to Kuppito Forest overlooking Willunga. 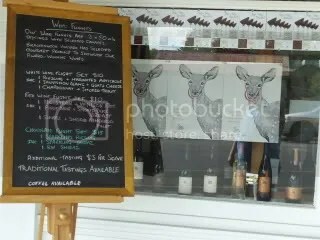 This cellar door is relatively new and when I first saw it the blackboard out the front and saw they had wine flight options – 3 options each having 3 wines each matched with a food sensation. I did not enter the facility as I took the wine flights as the only options to taste their wine. I was very curious about the wines and decided to ask the owner if I could taste the wine only – not worry about the food. My timing was excellent as I was directed to the cellar door for a specific weekend as they were about to release their 2009 MC Syrah (Maceration Carbonic) and they also had a vertical tasting of this wine from 2005 – now there was a reason to goto their cellar door. This Cellar Door is open Wednesday to Sunday 11 am to 4 pm plus any Public Holidays not already covered. This wine was made with traditional bottle fermentation techniques and was only recently disgorged and will need some time to settle down. This wine was for me surprisingly good – I was not sure what I was going to find as this was the first Sparkling Riesling I can remember tasting. There was plenty of Riesling fruit characters with nuances of green apples and passionfruit. The lingering acid is also a highlight. The bead was fine and strong and I suspect would be quite long lasting. I am a fan of well made Riesling and I certainly enjoyed this presentation. I am told the 2006 vintage of this wine is currently drinking well and I suspect the 2008 wine will also age gracefully. I have a couple of bottles and I don’t think I will be able to wait too long to drink them – one may even be opened on New Years Eve! MC stands for Carbonic Maceration and is a whole berry fermentation technique that is used to make softer fruit character wines. The best known wine made with this technique would be french Beaujolais. The wine style generally produces early drinking fruit driven styles and in my experience is unusual to taste MC wines with 5 years age. Thus for me this vertical tasting was fascinating and worth the time to visit the cellar door and taste them. Please note that this vertical tasting is only held over one weekend every year. Lots of soft cherries and blue berry characters. The wine is showing a bitter finish and I would consider this wine past it’s best. There is plum, cherries and blueberries with a hint of violets. Generally this wine has more lift on the nose but has a lighter finish on the palate than the 2005 wine. This was my favourite wine from the older wines. Interestingly it had 15% barrel fermentation and showed a tighter tannin structure. There was strawberries and pepper on the nose with a well rounded mouthfeel of strawberries and soft rounded tannins. If you had some of this wine I would be opening it soon as it will not get any better. Interestingly this wine has glass stoppers – I had not previously tasted wine with glass stoppers. The winemaker was not complementary about the stoppers as there was a significant number of bottle leakages from his wine storage. The wine could be said to be more old world – less overt fruit flavours and more of the earthyness. I found the nose a little closed but there was agreat mouthfeel (almost viscous). When it was released Halliday rated this wine at 94 points. This was the new release wine and it showed it. The dark cherry nose was fresh and paved the way for bitter cherries and chalky spice on the palate. This wine is worth trying and based on the vertical tasting would even do well with up to a years cellaring. A food pairing with Creamy Tomato Chicken Pasta would work well. As I explained to the people at Brakenwood Vineyard – I am not a fan of Pinot Noir, however I have not had any of the good ones. So I will keep on trying this varietal with a negative view until I taste a good one. The aroma of the wine is characterised by cinnamon and dark cherries. The palate was full of red and black cherries with hints of cloves and nutmeg – wonderfully complex and fuller bodied than I expected. OK you got me – this wine I could drink with more complex foods maybe a venison pie. As expected this wine is lighter than the “normal McLaren Vale Shiraz”. This machine harvested wine has fresh plums and pepper on the nose, with the palate full of plums, blue fruits, cinnamon and cracked pepper. The wine is well balanced and not over oaked. The hand picked expression of these grapes was similar to a McLaren Vale Shiraz. This wine saw new French oak and spent longer in oak than the previous wine. The fruit and wine expressions were typical big Shiraz (black fruits, plums & pepper) with layers of obvious oak and skins/pips tannins. There is also hint of cloves on the back palate. One of my favourite styles – particularly at Christmas with Turkey and Cranberry Sauce, a partnership made in heaven! I suppose I had better talk about the wine. There was an unusual hit of cinnamon on the nose with the usual plum and black fruit palate, with the usual pepper and chocolate nuances. The wine has some sweetness (8 g/L) but it is not a sweet bomb. One bottle of this was consumed on Christmas Day – what a joy. RW stands for Raisin Wine – the handpicked shiraz bunches were laid on a straw bed for 88 days, then crushed and wild fermented. The resultant low volumes were stored in French oak for 18 months before bottling. This dry wine smelt of raisins and berries with bitter chocolate, cinnamon and raisins on the palate. What an unusual wine – but this would be wonderful with some strong cheeses. A wonderful infusion of sweetness, apricots and slight oak flavours. It was a pity I had my Xmas pudding wine already organised – but wait, I made 2 puddings so one of these will be consumed with the second pudding on New Years Day (if it lasts that long). This entry was posted in Mclaren Vale, wine and tagged cellar door, Shiraz, Small Producer, wine. Bookmark the permalink.